Products function in an extremely competitive landscape vying for every impression it can get among the millions of potential customers available online. Getting your startup visible or discoverable is one thing, getting them to convert on your website and retain them is an even tougher task with the plethora of services and products that the consumer is forced upon. This is why it becomes so very important for products to understand each and every activity of the user right from the first time a potential customer/ user discovers their service or product on the web to the point they convert and start coming back to their website. It is crucial for a marketer to appreciate the insights data can provide on user behavior and take necessary actions to correct and optimize wherever required. It is also crucial for a marketer to measure the right data and understand it’s essence for better improvement of the customer lifecycle on their website. In my previous post, we had discussed the importance of measuring the right macro metrics. For understanding and validating Product/ Market fit, one needs to measure Activation and Retention. However to completely understand the lifecycle of the Customer one needs to also measure the other three elements: Acquisition, Revenue and Referral. Top of the funnel represents the first interaction a user has with your brand/ product. There are plenty of channels on which the interaction would happen and one would need to optimize for each of the channels the interaction happens on. The best solution is to always focus on at max two of the channels where the interactions seem to be most effective. With the new Universal Google Analytics Tool, you can get the channel details at Acquisition » All Traffic. The above table gives you a good understanding of all the various channels that drive traffic on to your platform. You can export the data to an excel sheet and then use a pivot table to understand what medium acts as the best option to drive first time traffic so that you can focus and optimize for that channel/ medium. The above search result gives you a healthy number of similar sites with similar target audience who would be interested in your site. Refining and cross-posting your contents across these websites can also help you in getting additional traffic. You can even automate a few of these by using a service like IFTTT where you create recipes for simultaneously posting on a number of these platforms. Remember, it’s always a good practice to tag the various URLs you use to drive traffic from various campaigns on referring sites. You can use the standard URL builder which google provides to generate tags. By generating campaign URLs, you can identify the source of referrals to your website, whether visitors found the link from within a newsletter, social media post or other marketing campaigns. By naming the three main campaign tagging elements: source, medium and campaign, Google Analytics will display information about where the referral originated. Simply complete the tool’s three-step form. Optimize the content to make it relevant if it’s outdated. If it’s your main landing page, change the message or positioning if required. Use the heatmap tool to better understand the user interaction on the pages and optimize your page accordingly. Make the content more comprehensive so that more people will find it interesting and informative. Build more relevant internal links to the weaker pages to give them more link juice. You can prompt the user to sign-up for email newsletters or at least try and convert them on any of your micro-conversions before the user leaves. Middle of Funnel in the Digital Marketing Funnel is the point where in the user is moving from an initial product or brand interaction to a first sale/ to any major interaction on the platform. You might not be able to get a user to convert during this stage but it’s crucially important for companies to target micro-conversions during this stage. It’s important to track the sources or channels through which the users come back to your site during this stage and it’s also important to measure the paths taken by the users in completing the micro-conversions or goals set on your page. For understanding user paths, GA has an option called Visitor Flow under Audience that visually represents the user path on the website and the drop-offs at each stage. 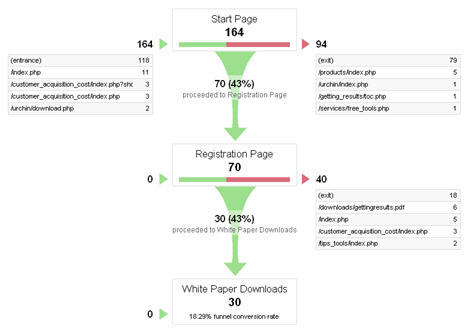 The Visit Flow Report is a nice and a better representation of the traditional click path report. One can view the visitors moving between nodes. One also has the option to view particular segments of users based on region, campaign, traffic source, country etc and their flow/ browsing pattern on the website. The goals would vary based on the type of website you are measuring for. To set up these goals, you can login in to the admin panel of your Google Analytics dashboard and then click on the Goal tab. You have different goal types to chose from: Destination, Duration, Pages/ Screens per visit or Event. In case of an E-commerece website for eg, if the marketer needs to track how many users complete the check-out process, then he/ she would have to chose the type of the goal as “Destination” in the first step. In the second step he/ she would have to define the destination page which would complete the goal (Conversions). For creating the funnel, you would need to specify each step (page) the user traverses before completing the final goal. The funnel visually represents each stage in the micro-conversion process also specifying the drop-offs at each stage. You can create, based on your requirements, multiple mini-conversions and funnels to better understand user flow during this middle stage of user lifecycle. For figuring out the most popular channels in the MOF, we would have to do some manipulation using excel to weed out the first and the last interaction channels. The bottom of the funnel is the last touch before someone buys. These channels are very important as it let’s you identify which channels to focus on to complete conversions. You can find this data in Conversion > Attribution > Model Comparison Tool and select your model as the Last interaction. You can use these data on the best channels for driving traffic on to your website to further improve and optimize. In addition to standard segments that are available in GA to chose from ( You would have noticed this when we discussed the User Flow path), there are also a wide variety of custom user segmenting options that lets you better understand each set of users. You can create your own segments from the dashboard by clicking on the drop-down next to the All Visits tab that’s present as default. GA with the latest update now has the ability to segment visitors and not just visits, which is something GA lacked compared to tools like Kissmetrics and Mixpanel. Now click on the Create Segments Icon to define your segments. There are a wide variety of parameters you can use to create segments or else you can use any of your own created events as well to define a segment. Refer this post for a great list of custom advanced segments which you can use. Using segments, you can slice and dice your audience in ways never imagined before. You can create segments based on first purchase value, browser being used, platform being used, device on which the visitor opened the site, purchase value during a period etc. I can very well use this data to do a cohort analysis which is very important at an early stage especially if you are on a lean methodology and constantly iterating, measuring the behavior of the set of users who come in during each of these iterations. Even otherwise, there is tremendous amount of insights analyzing segments will give you.